Diabetes mellitus (DM) is known as an important risk factor for surgical site infection (SSI) in spine surgery. It is still unclear however which DM-related parameters have stronger influence on SSI. 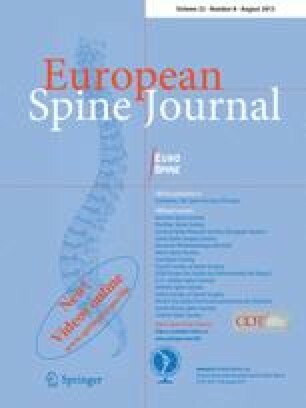 The purpose of this study is to determine predisposing factors for SSI following spinal instrumentation surgery for patients with DM. 110 DM patients (66 males and 44 females) who underwent spinal instrumentation surgery in one institute were enrolled in this study. For each patient, various preoperative or intraoperative parameters were reviewed from medical records. Patients were divided into two groups (SSI or non-SSI) based on the postoperative course. Each parameter between these two groups was compared. Univariate and multivariate analyses were performed to determine predisposing factor for SSI. The SSI group consisted of 11 patients (10 %), and the non-SSI group of 99 patients (90 %). Univariate analysis revealed that preoperative proteinuria (p = 0.01), operation time (p = 0.04) and estimated blood loss (p = 0.02) were significantly higher in the SSI group compared to the non-SSI group. Multivariate logistic regression identified preoperative proteinuria as a statistically significant predictor of SSI (OR 6.28, 95 % CI 1.58–25.0, p = 0.009). Proteinuria is a significant predisposing factor for SSI in spinal instrumentation surgery for DM patients. DM patients with proteinuria who are likely to suffer latent nephropathy have a potential risk for SSI. For them less invasive surgery is recommended for spinal instrumentation. In this retrospective study, there was no significant difference of preoperative condition in glycemic control between the two groups.